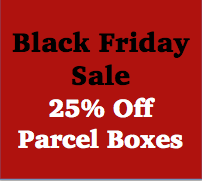 Black Friday 2015 - 25% Off Parcel Boxes - Simply apply the Voucher Code below at the Checkout this Black Friday! Need a parcel box this season, so you never miss a delivery? With the amount of online shoppers growing every year, the demand for a secure parcel box is imminent. If you don't want to wait at home all day, now is the time to invest in a parcel box, at a discounted price, with different models available, simply select each to view product specifications.